I was rummaging through old photos this morning, (because it’s Thursday and Thursday is scrapbook day) and I found these of me (above) when I was a kid. Lord, I was cool. 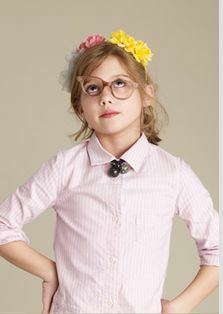 I just threw my glasses on, put a flower in my belt loop and hung out with my friend who loves yoyo’s. Unfortunately these are not of me. I was the kid that was into 4-H and drew red triangles on the right back pocket of my jeans. 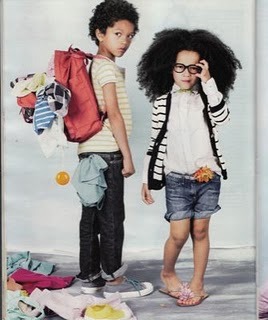 These photos are from Crewcuts, the J-Crew kids catalogue. Alright, I’m not the biggest J-Crew fan. I like their stuff in theory, I shop there a lot for work, good silhouettes, pretty colors, good return policy, (if ya know what I mean, elbow, elbow) etc. But for how trendy and cheaply made it is, I find it too expensive to buy for myself. I panicked last year, desperate for a cardigan and bought one for $100 and within 2 weeks it had 3 holes. Unhappy was I. BUT, the point of this, is the art direction. These kids look so f-ing cool – I want to be them, but impossible! I could never compete. These kids live in Fort Greene, they tend to their community garden, they have late afternoon lunches at Cafe Gitane or at ironic taxadermied joints. They listen to KCRW bands, get invited to P.S. 1 openings; their obsessed charter school teachers beg them for coffee dates, where they’re rejected because they are having early cocktails with the 30 Rock cast – which they are actually doing only because they’ve been putting them off for just years, and really they’d much rather be at home listening to This American Life and curing their own meats. And that, folks, is what good fashion styling and photography can do. And that’s why despite the overpriced-ness and cheapness of their clothes, I will probably make my kids, (I’ll call them Sweetie and George) wear them. Nice job, J-Crew art direction and styling, you’ve fooled us all the way to the bank.